Posted January 22, 2019 District Lodge 837 Comm. IAM members all across the nation are engaged in the battle to end the longest federal government shutdown in U.S. history. 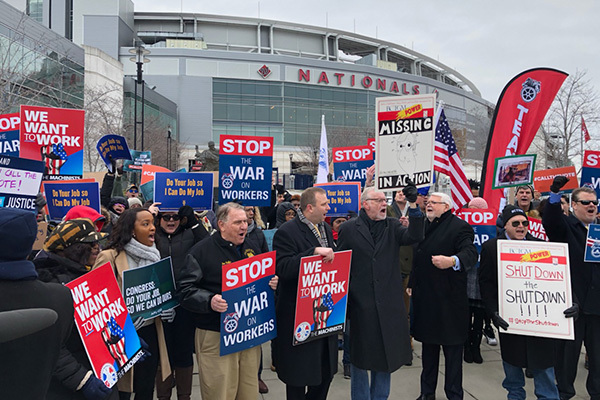 IAM members several other unions recently held a rally at the Nationals Park in Washington, DC where Senate Republicans were gathered for a retreat instead of voting on a House bill to reopen the government. Members gathered at the rally demanding Senate Majority Leader Mitch McConnell to immediately call a Senate vote to end the shutdown. TAKE ACTION: Call our hotline at 866-803-8830 and tell your U.S. Senators to end the shutdown and put our federal workers and contractors back to work with pay. Thousands of IAM members who work or contract for NASA, the U.S. Coast Guard, the U.S. Forest Service, the National Park Service and others are working without pay or furloughed due to the stalemate in Washington. Wednesday Jan. 23, 12 p.m. – 2 p.m.
Visit 211.org to locate organizations in your community that provide support and assistance to working families. IAM DISTRICT 837 | Copyright: IAM District 2019.